Children had an exciting opportunity to learn about Nebraska last week through the Truckin’ Through Nebraska Mobile Children’s Museum in Albion. 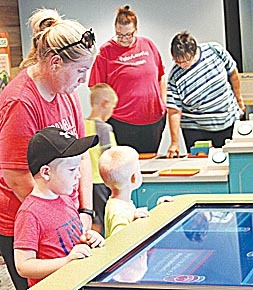 More than 600 area children and adults visited the facility last Tuesday and Wednesday, July 18-19, while it was set up on the JSMM Farms property at Second and Main Streets. The museum was created for the kids of Nebraska in honor of the 150th anniversary of statehood in 2017. The museum will tour from April through the fall of 2017, visiting 42 Nebraska communities. While the mobile museum is intended to delight children ages 5-12, audiences of all ages will be captivated by the exhibits. At the mobile museum, children and families had the opportunity to learn about Nebraska’s history, and also discovered facts about their heritage and possible future careers available in the state.